The Project began when I found ten discarded volumes of Britannica Yearbooks on the street, spanning the years 1938-1948, minus the 1939 volume, which was missing from the group. Each volume is a summary of the events of the previous year. Collectively, the Yearbooks document some of the most eventful and harrowing years of the 20th century. As an artist, I was fascinated with the content and images in the volumes and wanted to work with them in my art. I thought other artists might be interested, too and subsequently founded this project. The ten artists involved in the Project are painters, sculptors, printmakers, installation and video artists, representing a wide range of ages, nationalities, and background. Each was given a copy of one of the Yearbooks. Some chose his/her years; for others it was random. The artists have created a narrative of personal responses to the Yearbooks, concerning themselves with the volumes as physical objects and also as repositories of information: their constituents (paper, ink, thread) and their content (words, ideas, illustrations, knowledge, and history). 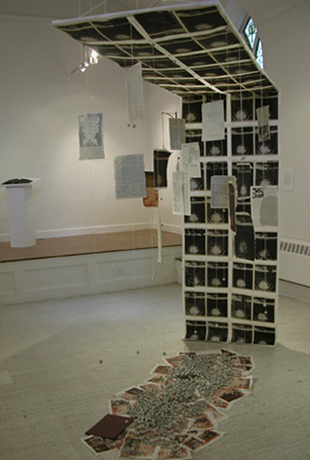 The ten works were exhibited together at the New Art Center, Newton, in 2005 offering the viewer a glimpse of how contemporary artists interpret history. An interactive installation was set up so that gallery visitors may record through text and/or images their memories, experiences, and/or knowledge of 1939, the missing year.